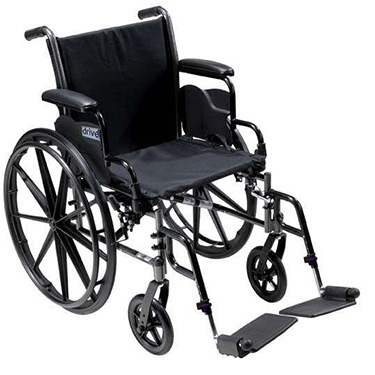 The Cruiser III is the top selling line of dual axle (K0003) wheelchairs from Drive Medical. This wheelchair now comes with riggings in the carton! Carbon steel frame with silver vein finish (arms and riggings are black). Seat to Floor Height: 17.5" to 19.5"
Weight Limit: 300lbs for 16-18" seat width, 350lbs for 20" seat width models. This is our second CruiserIII by Drive wheelchair and we like it. The holes in the legs for lengthiness and shortening were not the same and are in very different holes to make the footrests even. They are a little uneven still. I needed a wheelchair narrow enough to provide access to rooms in my house that have doors too narrow for my standard wheelchair. This wheelchair meets that need perfectly. Weight Capacity: 300 lbs, 350 lbs.